Before we kicked off our incredible weekend in Victoria soaking in the holiday lights and afternoon tea, Dek and I headed into downtown Seattle to see a man about a carousel. 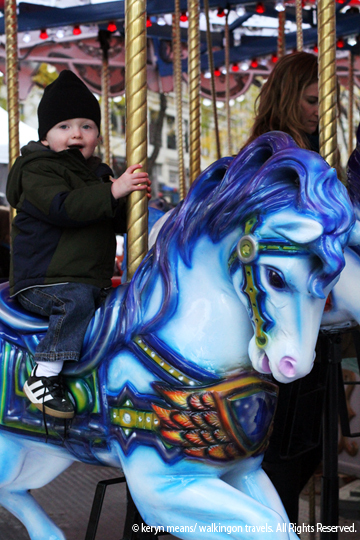 Dek had never been on a carousel before. I hadn’t been in who knows how long. I knew the Holiday Carousel was up and running by this point. It always started right after Thanksgiving when the big tree went up in front of Westlake Center. Well the tree may have been a bust since a work crew getting a stage set up blocked it, but the carousel was not. We arrived with my friend Nic and her daughter Lee a little early, just behind a small school group. The kids were so excited to be out of their strollers and able to run around that they didn’t care about a 10 minute wait. In fact, they had no idea just how much better their day was about to get. Once the ticket booth opened, we paid our suggested donation and went to claim a horse. I’m not sure who was more giddy, me or Dek. He let me plop him right on a horse and held on tight. “Was this it mama? Oh boy was it cool,” or at least that’s what I like to think he was saying in his head. Oh no my son, this horse is about to move. Hang on tight! Both the moms and kids had a great time on the carousel. Only thing missing was the dads to take more pictures of us. Oh yeah and enjoy a ride. Dek and Lee shriek and laughed along with Nicole and I as the music started playing and we went round and round. Up and down went the horses but the smiles never stopped. All too soon our ride was over though. Oddly there were no crazy protests from the kids. If anything I was the one disappointed. It had been too short! But the line had grown since our ride and I was not going to wait again. Plus another treat still awaited us. We were headed to my favorite lunch spot in town, the sandwich counter at Three Girls Bakery in Pike Place Market. If you are ever pregnant and visiting Seattle head here right away. They load on the pickles to perfection, which makes their chicken salad sandwiches ten times better. I have heard the meat loaf sandwich is good, Dek sure liked it, but I just can’t get away from that chicken salad. So a carousel ride and a sandwich? Yeah, this was my perfect holiday morning with my son. What’s your perfect day with your kids look like this holiday season? This is precious! Nice share. 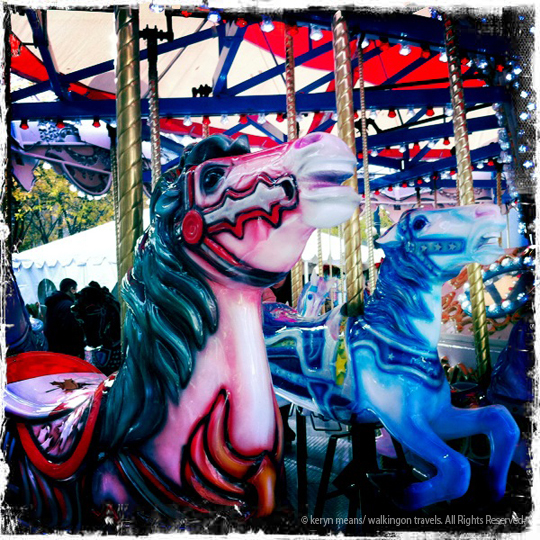 Carousels are magical! I love that first shot of Dek on his horse – he looks so ready for whatever is going to happen.